Man. Hasbro was really spoiling us around Revenge Of the Fallen. The design & engineering of movie toys at that time were topnotch. Man, I scrambled for a Deluxe Sideswipe back then. But that's when the design got scrutinized. That resulted of being toy designs got nerfed slowly around DOTM and eventually down to TLK. "Are the toys (from the design stand point) really for kids in general or for adult collectors?" There are parents complaining the complexity of ROTF toy designs that their kids can't even transform it as easy the 2007 toys. As much as i dislike the movies (exept for the first one) the ROTF toyline is still the best era for movie toys we had. Transformations where not that hard,i did have a hard time transforming mixmaster but i can do it fine now. some where frustrating but most most where fun. Plus i like the design for the first 3 better. Now they are to humaniod with almost no vehicle parts visible in robot mode (in the movies,the toys do it a bit better) but i still like to see what they transformer into while they are in robot mode,but in the last 2 movies you can't realy tell. (Exept for barricade and bumblebee. The dotm line wasn't bad either. Loved voyager shockwave fireburst prime sentinel prime and the ark playset . Some good figs there. This studio series is killing it though. Missed out on blackout as the store only got 1 of the leaders in so he didn't last but I'm sure they will be in again. Sure can't wait for 4500X to show up at my house tomorrow! I remember some complained the complexity of ROTF LC OP. hahaha..
Week is over, and there was no email saying my Blackout is ready for pick up. Now I have to wait for the weekend to end and wait to see if next week will have it in stock. I've found Blackout at Toyworld Melbourne going for $94.95 AUD. I wish i had money to get Blackout, my first impression seeing it in person is that it looks alot better in person. If anyone has the figures, could I get a picture of Studio Series Blackout with ROTF Voyager The Fallen? Just opened mine awhile ago! Such an awesome birthday present to myself! And I gave my nephew his today when we went out to eat, he opened his present(even though his birthday isn’t til Thursday) and he loved it! Can’t wait to transform him in awhile. Just happened to have my Fallen laying on the desk today while trying to make space for Leader Blackout. I'll never think of Blackout as the largest decepticon anymore. Amusingly, that's pretty close to being in-scale. Blackout was dethroned as the Largest 'Con literally as soon as ROTF came out. Half the Constructicons alone are bigger than him. Totally Off Topic, but he was the biggest Decepticon in Transformers Animated. Got blackout from Amazon 49.99. Figure looks great and the transformation isn’t too bad except for the shoulders. Hands are meh but not deal breakers. My biggest complaints are the panel gaps and the pin on one of the rotors won’t stay in. Gonna return and hope for one with some better QC. I got my Leader Class Blackout and Grimlock today at the collector store in the next town. I'm pretty happy with them, but I'm going to have to wait till tomorrow after work to open them. Found Leader Blackout and Grimlock at my local Target today. Came home with Blackout. If I like it, I'll come back for Grimlock. For some reason, I have a feeling Blackout will be hard to find. I like his size. This is how he SHOULD have been back in 2007. After 11 years, we finally get a proper size Blackout. My target had 4 Grimlock and only one Blackout. Went ahead and got both, but yeah blackout is super popular and awesome in my opinion. Grim is good and fun too. I went back to get Grimlock today. I like it, but I like Blackout more. That flap doesn't peg anywhere to the tail and his right hand is mace ball. I hate that. I wish they gave him two hands and made the weapon as something he can hold. Otherwise, great Grimlock. Does anyones Blackout not want to fully tab flush? I cannot for the life of me get the two parts above the cockpit where the rotor engine hides to stay together and the right side of the copter (looking down from the top of the rotors) won't stay tabbed at all. I've double checked and messed with alignment and its all correct. 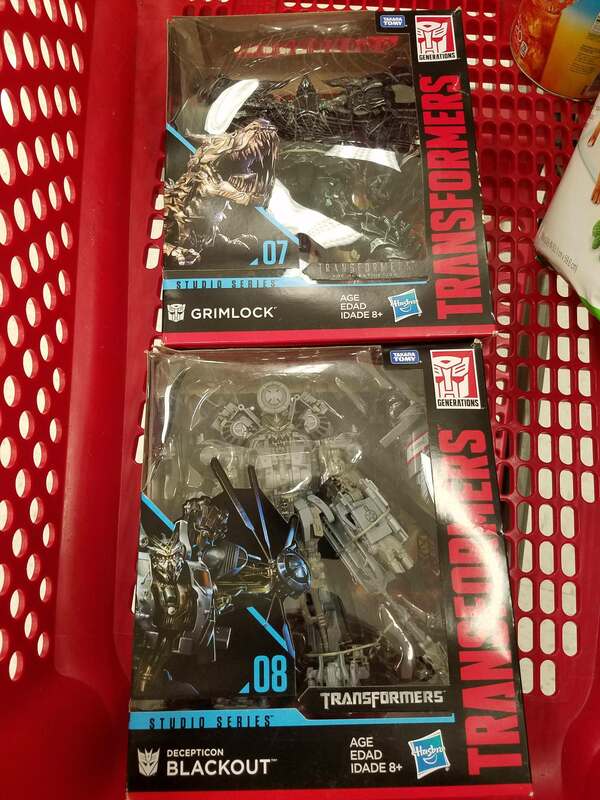 Managed to snag BOTH Blackout and Grimlock at Target today at the Whittwood center. Boxes on both looked someone tried to get at them, but whatever, couldn't believe my luck. They had a lone voyager Starscream and a peg or two of deluxes.